Sun., March 25, 2018, 7:25 p.m. They say the transition from high school to college ball is harder than it looks. But what if you haven’t even taken a look? Two years ago, Oregon freshman guard Satou Sabally was a promising international player in Germany. She was on the radar of several major programs, but apparently they weren’t on hers. 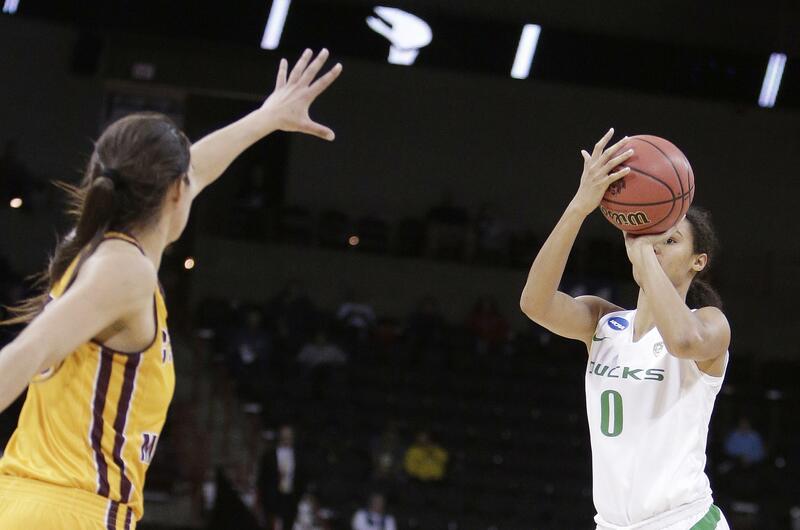 “I didn’t really know a lot about college basketball,” Sabally admitted Sunday as the Ducks prepared for Monday’s regional title game against Notre Dame. Finally, last March, Sabally decided to see what the fuss was all about. “I bought the ESPN pass … just for March Madness, to watch those people,” Sabally said to laughter from the media. Armed with that knowledge and her 6-foot-4 frame and years of experience in Europe, Sabally was an even quicker study on the court. Arriving in Eugene last fall, Sabally moved seamlessly into the American game. A starter by the 10th game of the season, she’s averaging 10.7 points and almost four rebounds along with 65 assists and was named Pac-12 Freshman of the Year. Back in Berlin, the Sabally family is watching with more interest than ever: Sabally’s younger sister Nyara has signed with the Ducks and will join the program in the fall. Likewise, junior guard Maite Cazorla didn’t see much college ball while growing up in Spain. “I’m really thankful for that,” Cazorla said. With only one day to prepare, the Oregon and Notre Dame players didn’t have the time for lengthy analyses of each other. So the Ducks and Irish decided to milk the clock, cramming as many cliches as possible into a few minutes. Oregon was at the top of its game, with point guard Sabrina Ionescu her usual unflappable self. Notre Dame also brought its “A” game. Forward Jessica Shepard took a question about dealing with Hebard and came back with an easy layup. “It’s definitely going to be a team effort,” Shepard said. Oregon and Notre Dame have never met on the court, but Graves knows the Irish quite well. The first came in Graves’ NCAA debut in 1999 with Saint Mary’s. Playing in a first-round game at LSU, the 12th-seeded Gaels took Muffet McGraw’s team to the limit before falling 61-57. Twelve years later, in 2010-11, Graves fielded the best Gonzaga team ever, but the Zags fell to Notre Dame 70-61 in the Holiday Hoops Classic. “If you would have watched that game, you wouldn’t have guessed that either team would have done what we did,” said Graves, whose team reached the Elite Eight. Notre Dame made it to the championship game, falling to Texas A&M. Published: March 25, 2018, 7:25 p.m.